Through the Magdalene Priestess Training, we hope to restore women to their rightful place as empowered individuals fully living out both their Divine and Human natures as love. The Magdalene Priest and Priestess Training continues the work of the Magdalene/Christ by empowering you to live out the fullness of your unique giftedness – both for the sake of your own fulfillment and in service to the betterment of the world. 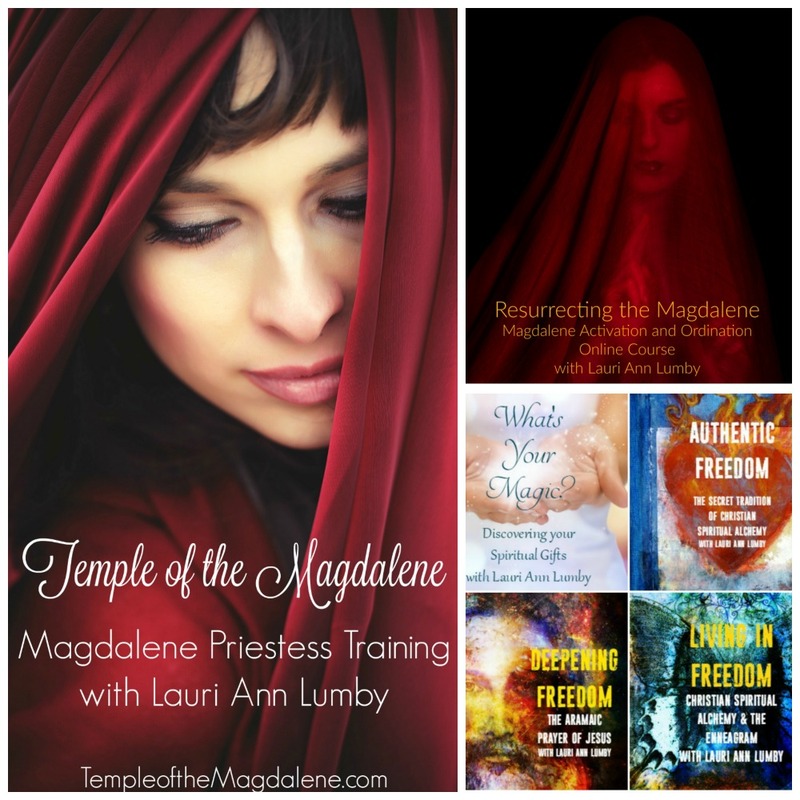 The Magdalene Priestess Training integrates modern psychology with the ancient wisdom of Western spirituality practices. The inspiration for this program are the original teachings of Jesus* which Mary, called Magdalene fully understood, embodied and then went on to teach others. To join, you must have a (dot)Love Basic membership or higher. Marcy Hauer is a Licensed Massage Therapist, and Reiki Master Practitioner. Marcy’s practice is largely informed by her study and practice of yoga and meditation. In addition to offering Swedish (relaxation) massage, Marcy offers Reiki and incorporates both Reiki and acupressure into her sessions. Marcy have been in practice for 15 years as a Licensed Massage Therapist and has completed the full Magdalene Priest/ess Training. Marcy is also a long-time student of the Course in Miracles and a host of the Total Transformation Course. Learn more about Marcy and the Total Transformation Course HERE. Starting October 9, 2018, 2:30-4:30 CST!! Are you finally ready to be done with all forms of suffering? And are you willing to genuinely heal the fundamental CAUSE of pain, disease, relationship conflict, scarcity and fear of any kind? If you are, this may be the perfect path for you! Marcy Hauer will be co-facilitating a 12-month online Total Transformation Course journey based on the deeper teachings of A Course in Miracles and The End of Death trilogy by Nouk Sanchez. I am so happy to connect with you. We, together, were created by Holiness Itself. And we are meant to live from this Holiness in relationship to ourselves, each other, our bodies, and everything in this world. No separation between us and therefore no fear of anyone or anything! Because of What we truly are, because of What we come from, we all desire holy connection and communication, peace, joy and abundance in all facets of our life; and reliance on a Guidance system that knows us intimately and guides us lovingly and certainly. In the spirit of this I would love to join with you to open to our inherent Real/Holy Self and all the implications of That! In TTC we come together in this humble and courageous pursuit. We question all of our beliefs, judgments, values and feelings. We take the plunge to participate in holy communication with ourselves and each other via the 7 Key Principles: willingness, accountability, defenselessness, radical self-honesty, vulnerability and transparency, trust and gratitude.Through our daily practice of authentic communication and forgiveness/Atonement we are liberated from all that binds us to suffering. We are beings of Love and our purpose is to live from and extend this Love! Only this will bring us total peace and joy. ACIM came into my life in 1991 shortly after my desperate plea to God (“if He was really out there and could hear me this would be a really good time to show up”) to help me find another way to live as my way did not work. I could no longer live with the excruciating pain of chronic severe anxiety, panic attacks, debilitating fears and depression that held me captive. I knew right from the start ACIM was what I was looking for and slowly very slowly I healed. It wasn’t until I came across Nouk’s books, Take Me To Truth and then The End of Death and attended a couple of Nouk’s workshops that my healing sped up. Healing greatly accelerated from there by joining TTC. The TTC journey is a very powerful journey of freedom as we return to the shared One Holy Self. For myself, these past 2 1/2 yrs of the TTC journey have been the most miraculous and healing time of my life. One particular big challenge I had in TTC was the immense fear of being in a group and joining live online. It is the great fear of being seen and judged. I am finding this is a shabby belief that keeps me small and lifeless. The ego is more fully exposed in a group setting and it cannot survive in a group where the intent is to close the gap and return to sanity. The ego is a loveless thought system sustained by fear. It is by the powerful joining of mighty companions that our fears crumble and we are healed together. And by joining together in Absolute Truth and Perfect Love our healing is collectively greatly accelerated and our path is simplified. My gratitude runs deep for Nouk and Daniel and Nouk’s deeper teachings, Daniel’s vision of TTC and and the abiding love and support of everyone in TTC and beyond. Everyone we encounter and everything we experience is an opportunity to heal, to be restored to our shared Holiness. Please sincerely consider this transformational journey and please do not let fear stop you! Lisa and I together with Holy Spirit will host our group. As miracle buddies from the start we have experienced many miracles together. We aim to go all the way, both feet in one canoe as Nouk and Tomas would say! We would love to join with you in this holy journey. Learn more about the Total Transformation Course and Register HERE.